Fibre optic broadband (usually shortened to 'fibre broadband') is the future of broadband. Currently, two forms of fibre broadband are being rolled out by BT: Fibre to the Cabinet (FTTC) and Fibre to the Premises (FTTP). Fibre broadband can deliver significantly faster download broadband speeds than conventional broadband (ADSL and ADSL2+) services. Curently, FTTC services offer download speeds up to 76 Mbps while FTTP services offer download speeds up to 330 Mbps. A critical issue with fibre optic broadband is availability, although this is increasing steadily. By September 2013, BT's fibre broadband network could be accessed by about 17 million homes and businesses in the UK. While FTTC currently accounts for the vast majority of fibre broadband connections, FTTP take-up will increase with the increasing availability of BT's FTTP on Demand product (which launched in Early Market Deployment form in April 2013 at a limited number of exchanges). Eventually, this will be available in all areas where FTTC is available. Conventional broadband services were launched in 2000, and currently serve the vast majority of households in the UK, using ADSL and (more modern) ADSL2+ technologies. Conventional broadband is carried along copper cables all the way from your BT exchange to a local (green) street cabinet and then to your premises. 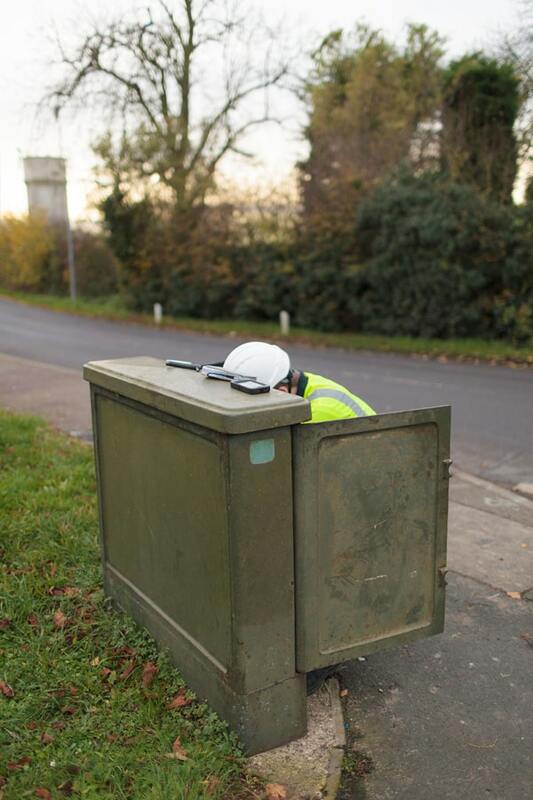 The photo on the left shows a BT Openreach engineer working at a street cabinet. Inevitably, the broadband signal suffers attenuation (loss) as it travels along the copper cable all the way from the exchange to the street cabinet (particularly if the exchange is several kilometers away). From the street cabinet, the broadband signal has to travel even further to your home or business premises. The distance between your BT exchange and your premises can be relatively long - often several kilometres for many people, particularly those in rural areas. As the broadband signal is attenuated as it travel along the copper cable, it also becomes more susceptible to interference, and long lines can be problematic in terms of both speeds and reliability. As discussed in our article Chart of ADSL speed versus distance, the speeds achieved several kilometres from the exchange can be substantially lower than that achieved very close to the exchange. For example, someone located about 0.5km from the exchange could achieve 24 Mbps and 8 Mbps downlink connection speeds with ADSL2+ and ADSL, respectively. At 3 km, these speeds would have reduced to about 9 Mbps (ADSL2+) and 7 Mbps (ADSL). Fibre broadband eliminates the need for the 'lossy' copper cable between the BT exchange and the street cabinet, to significantly increase broadband speeds. What is different with fibre broadband? Fibre broadband utilises fibre-optic cables in the delivery of broadband. Fibre-optic cables are immune to interference and do not suffer the signal attenuation experienced by copper lines. Fibre to the Premises (FTTP). The vast majority of fibre broadband services currently being deployed across the UK are based on (cheaper) FTTC technology. FTTC and FTTP are now considered in turn. 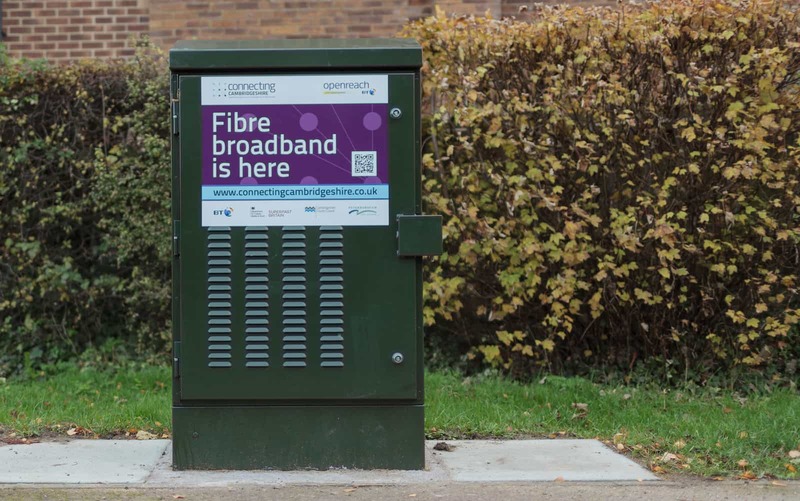 With FTTC, a new fibre street cabinet is installed near to the conventional street cabinet (shown previously), and this new street cabinet is connected to the BT exchange with a fibre-optic cable. The photograph below shows a new fibre street cabinet. The broadband equipment previously housed in the exchange (known as the Digital Subscriber Line Access Multiplexer or DSLAM), is now located in the new street cabinet. In effect, the BT exchange has moved to the street cabinet and the signal loss along the copper cable between the exchange and the conventional street cabinet has been avoided. FTTC still makes use of the copper wires between the street cabinet and nearby residential and business premises, as shown in the diagram below. However, the distances involved are typically much shorter than the original copper cabling all the way back to the BT exchange. As a result, significant speed improvements are achieved. As ADSL and ADSL2+ are limited to 8 Mbps and 24 Mbps respectively, BT's FTTC system currently makes use of Very High Speed Digital Subscriber Line 2 (VDSL2) transmission technology to provide faster speeds than ADSL and ADSL2+. When originally launched, BT’s FTTC service delivered up to 38 Mbps downstream. In April 2012, BT announced an increase in maximum download speeds to 76 Mbps, with up to 19 Mbps upstream. The one big weakness of FTTC is its continued reliance on the copper wires between the street cabinet and the nearby residential and business premises. Just as data rates of conventional (ADSL and ADSL2+) broadband reduce with increased distance from the exchange, so the data rates achieved by FTTC fall as the distance between the street cabinet and nearby premises increases. As shown below, and described in more detail in our article Chart of BT FTTC (VDSL2) speed against distance from the cabinet, download speeds falls to about 60 Mbps when located 500 m from the street cabinet, and about 28 Mbps when located about 1 km from the street cabinet. With FTTP, there is an end-to-end fibre-optic connection from the BT telephone exchange all the way to the premises, as shown in the diagram below. From a performance perspective, FTTP is the best method of delivering very-high-speed broadband services, offering higher speeds than FTTC, particularly for properties that are not located very close to the street cabinet. 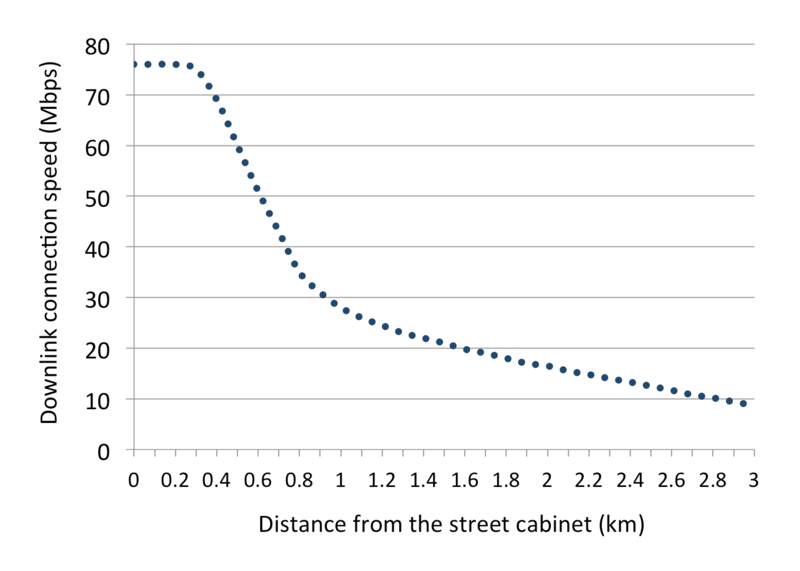 As FTTP does not rely on the copper wires from the premises to the street cabinet, broadband signals are not attenuated as the distance from the street cabinet increases (as with FTTC) so FTTP speeds do not fall with distance. Furthermore, FTTP is not susceptible to interference like FTTC services. BT's FTTP on Demand broadband service is currently only available on a small proportion of exchanges, meaning that FTTC is the only available fibre option at most exchanges. Eventually, FTTP on Demand will be available in all areas where FTTC is available. FTTP on Demand offers download speeds of up to 330 Mbps, with up to 30 Mbps on the upstream. In the future, significantly higher speeds are likely from FTTP. BT has already successful undertaken live trials in 2011 of FTTP in Kesgrave, Suffolk, with download speeds of 1 Gbps downstream (with 400 Mbps upstream). More recently, in November 2012, BT demonstrated the capability of its FTTP broadband service to deliver speeds up to 10 Gbps to a business in Cornwall. So, if FTTP can deliver higher speeds than FTTC, why is it not being deployed everywhere? The answer is because of costs. In general, FTTP is significantly more expensive to install for BT than FTTC. While FTTC uses the existing copper wires from the street cabinet to premises, FTTP involves the installation of a fibre-optic cable between the premises and the fibre aggregation node (which is located close to the FTTC-enabled street cabinet). When it was first made commercially available, FTTP on Demand had a distance-based construction charge, in addition to a fixed installation fee of £500. The distance-based construction charge has been determined by the distance of the customer's home or business from the fibre aggregation node. BT Openreach estimated that more than half of premises (55%) would incur a distance-based charge of between £200 and £1000. BT estimated that virtually all other premises would face a charge of between £1,400 and £3,500. It would be up to communications providers to decide whether to pass on the charges to businesses and consumers. For example, some ISPs could decide not to make an upfront charge to their customers and claw back the installation charge through higher monthly subscriptions. Originally, the BT wholesale price for FTTP on Demand was £38 + VAT. In January 2014, BT announced substantial increases in the monthly subscription and construction charges for FTTP on Demand, effectively creating a large pricing gulf between FTTC and FTTP. The wholesale monthly fee was nearly tripled to £99 + VAT. Furthermore, distance-related charges were nearly doubled with an additional £250 added to the fixed installation fee. As a result, BT estimates that around a half of premises could now expect to pay an installation charge in the region of £1,100 to £2,500. Where available, there are longer lead times for FTTP on Demand than for a standard connection due to the amount of planning and construction work that is required to extend fibre to a customer's premises. The current estimate is typically 60 working days for the service to be installed. We believe that FTTP is being positioned as a niche service for companies prepared to pay significantly for it. As described in our article Latest pricing positions FTTP as a niche product, we expect that a great deal more attention will now to paid towards bonded FTTC connections, particularly among SMEs seeking very high speeds, reliability and resilience. How do I find out about fibre broadband availability in my area? The roll-out of fibre broadband in the UK is currently quite complex since there is a mix of commercial and subsidised deployment being undertaken. From a commercial perspective, BT is finalising its £2.5bn investment to roll out fibre broadband infrastructure to two-thirds of UK premises by 2014. Inevitably, BT has been focusing on urban areas (rather than rural areas) where it believes that it will achieve the best return from its investment. Don't worry if fibre broadband is not currently planned for your exchange. As described in our superfast broadband page, public funding is being used to significantly extend the reach of fibre broadband services over the next few years. If fibre broadband is not available to you, don't despair! As detailed in our Increase Broadband Speed Guide, there are a number of free and extremely cost-effective techniques that you can use to maximise the speed of your existing broadband connection. For example, a filtered faceplate and a new modem/router could significantly increase broadband speeds. If your broadband speeds are extremely slow, you could also consider using multiple connections.